Unveiled on the morning of the first day of this year’s Shanghai International Auto Show, the Type 130 would be the first all-new car from the Hethel, England-based automaker in 11 years. The news arrived after word that Lotus parent company Geely would begin manufacturing cars in China, working from a new, $1.3 billion factory in Wuhan. A spokesman from Lotus declined to say when the factory would open but said the new vehicle would not be built there but at company factories in England. But having come through a sporadic sales history in North America and an ownership change in 2017 to the privately held Chinese automotive giant Geely, Lotus executives say the new electric vehicle marks a turning point for the 71-year-old brand. If all goes as planned, the million-dollar Type 130 will serve as the halo car for a new generation of Lotus motor cars. Despite releasing scant details of the new car, and only a vague rendering at the Chinese show, Lotus said the Type 130 is in “advanced stages of development.” A physical representation of the car will be revealed along with full specifications later this year in London, Popham said. Production numbers are expected to be very low, though the CEO said he has already received letters of intent from several eager buyers. The news of the Type 130 came with the additional announcement of the Lotus Evora GT4 Concept, a track-only racer with a lightweight carbon body, a 450-horsepower V6 engine, and a top speed of 170 mph. Both cars are examples of a renewed push at Lotus—after a roughly £1.5 billion ($1.97 billion) investment from Geely—to gain relevance in the key U.S. and Chinese automotive markets. Last year, Lotus sold just 1,630 vehicles globally; 228 of those were in the U.S. But there is indeed plenty of history to leverage. During the 1970s and ’80s, the brand was known for its racing success and association with the jet set—not the least of whom was James Bond himself. In 1978, Mario Andretti won America’s last Formula 1 World Championship as the driver for Lotus. 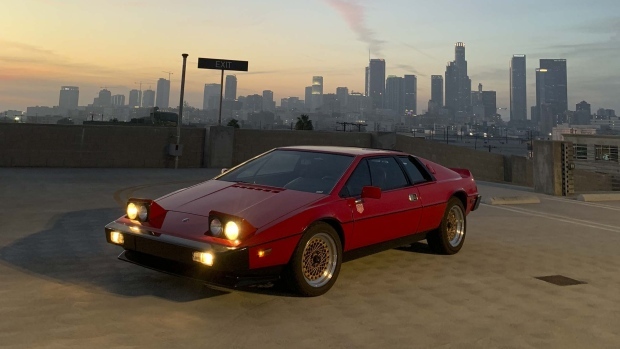 Lotus cars such as the Esprit were beloved for their supercool style—élan strong enough to make owners overlook their famously quirky mechanics, tight interiors, and sometimes lackluster build quality. As relatively fresh blood at Lotus—he joined in October last year—Popham seems to realize the potential to capitalize on the considerable brand heritage. He talked auspiciously about the millions of dollars Geely, which also owns Volvo and Polestar, has invested in the group, allowing it to begin work on a 2.3-mile track and experience center at company headquarters; a public restaurant; and a company museum. Lotus employs 1,100 people; between 300 and 500 additional hires will be added before the next five years in offices in China, the U.K., and Detroit, he said. In time, there will also be a Lotus SUV and other sports cars built on new platforms, he said. Popham also mentioned Lotus would consider opening a classics department where versions of fan favorites—the Eclat, Esprit, and Europa, say—could be restored with dead stock or modern components. Aston Martin, Jaguar, and Land Rover have successful programs doing the same.